Time flies when you're having fun. Hallowe'en gives us the opportunity to dress up... or dress your pup. Well, that's not my cup of tea, but it happens, and you have to admit, this guy is kind of cute. 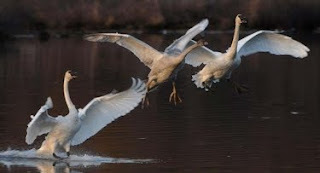 Fall in Anchorage is quite beautiful when you see scenes like these trumpeter swans. There remains a variety of wildlife within city limits, and that's another reason to visit Anchorage, any time of year. The shoulder season is becoming a popular place for corporate meetings and conventions, and the new Dena'ina Convention Center has become a premier venue for everything from circuses to trade shows, too. On the sports scene, West High School just won the state championship in football, and our Aces Hockey team is coming on strong this year, after a disappointing last year. Of course, the sports bars in town are all thriving, too, and it's surprising to me how much interest there is in college sports, and pro-sports, too.